I just read your blog and wanted to say FANTASTIC work!!! Keep it up! I went to school in Lagos, a city in Nigeria which is a country in West Africa. We had to be at school every morning at 8am, but we left school everyday at 1.30pm (except Fridays where we left at 2pm because we had clubs after school). Because we left school so early, we only ever needed snacks to eat at school which were usually sausage rolls, meat pies, sandwiches, cookies and sometimes even cheese balls. The school did not provide any meals for us so we had to bring these from home, which usually meant everyone brought their favourite snacks. On Fridays, however, because we stayed at school a little longer, our cook at home always made us an awesome Nigerian rice dish called jollof rice. Those were the best days! We sometimes had sweetcorn on the side which I loved as well, but mostly it was served with chicken or beef and 'dodo' (the English word for dodo is plantain: it looks like a banana but you can't eat it without cooking it. It is so yummy!). 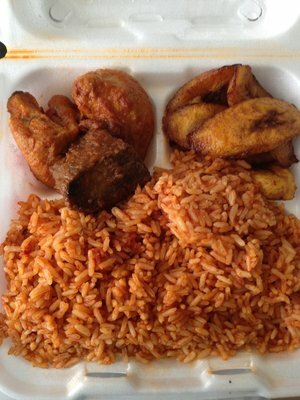 Because jollof rice was my favourite, I've attached a picture of what our school lunch looked like on Fridays. I'm now at boarding secondary school, and on holiday at the moment, so I sadly don't have these anymore. The dodo is in the top right hand corner of the picture and the stewed beef and chicken on the left side. There were always 0 pieces of hair because our food was cooked at home, haha. We had to use coolers to keep them warm till lunchtime. Well done on your blog once again!